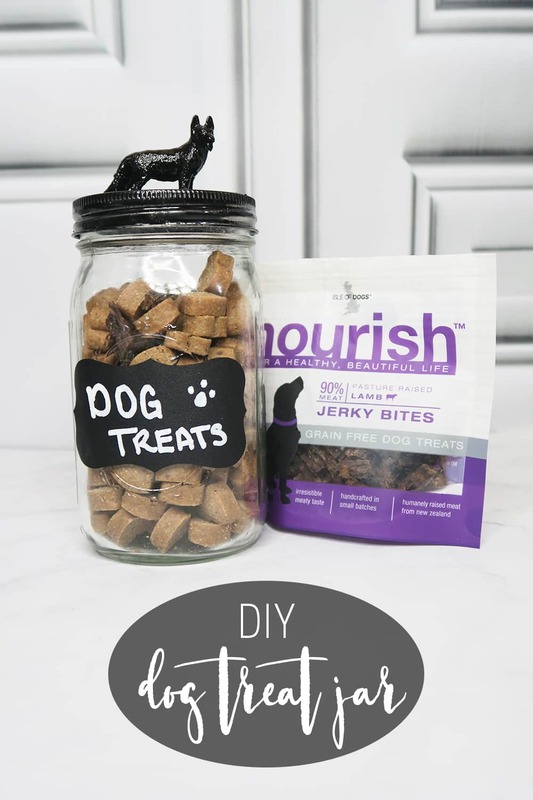 With just a few supplies, you can make this dog treat jar DIY. Keep for your furry friend or give it as a gift to a fellow dog lover! I’m currently a Brand Ambassador for Isle of Dogs and have been compensated for this post. All opinions are mine alone. It’s that time of year where my house starts overflowing with wrapping paper, baked goods, and gifts for loved ones. Every year, I try to do a mix of store-bought and homemade gifts for my loved ones. I find the perfect gift or two that they’ve been eying up and add in a few things I think they’d love that are handmade. Food gifts, crafts, etc. Our pup is no different. This year, she’s getting her own treat jar along with some of her favorite treats from Isle of Dogs. I’ve talked about Isle of Dogs before. In case you missed it, you can learn about winter skin care for dogs or learn how to help an anxious dog with their products. Sookie has tried most of their treats, but her favorite (by far) are the Nourish Jerky Bites. Nourish Jerky Bites are gently air-dried at low temperatures, in small batches. They are high in protein, grain-free, and made with all-natural ingredients. You can bet that she’ll be getting a few bags of these (along with the anxiety treats and skin treats I’ve talked about!) in her stocking. 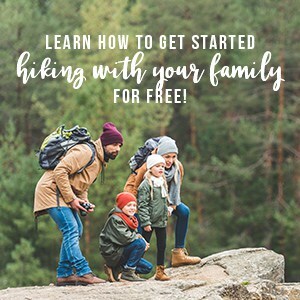 But if jerky bites aren’t your dogs favorite treat – Isle of Dogs has plenty of options for you! From dental chews to chewy treats, 100% natural baked treats to daily essential treats – you’ll be able to find something your furry friend will love this Christmas. Now, to make her special treat jar, we just needed a few supplies. Paint the dog figure and the lid in a well-ventilated area. Let dry. Write on the chalkboard label with the chalkboard pen and attach to the jar. Attach the dog figure to the lid with a dot of hot glue under each paw. Fill the jar with your pup’s favorite treats, place the lid on the jar and screw on the band. Keep it for your furry friend or wrap it up as a sweet gift for a fellow dog lover. What Isle of Dogs treats will be filling your DIY Dog Treat Jar? I recently got Hunter a bag of these treats and he LOVES them! The jar is a really cute idea! It would definitely make a great pet Christmas gift filled with treats! That dog treat jar is so cute I *almost* want a dog. That is so cute! From the photo, I totally assumed it was something you’d bought! 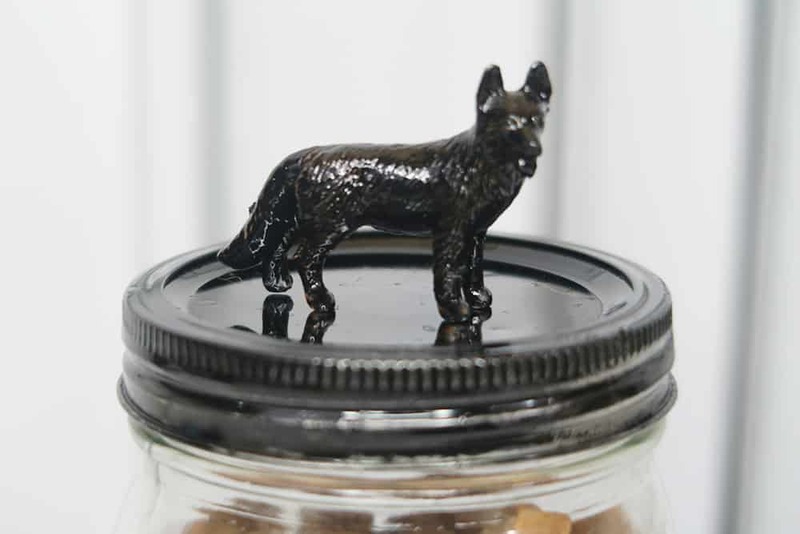 This is such a cute DIY doggie jar! I love it! What an adorable idea and it looks so cute! This is a super cute idea. Love it!